A dive is nothing without a few classic characters. 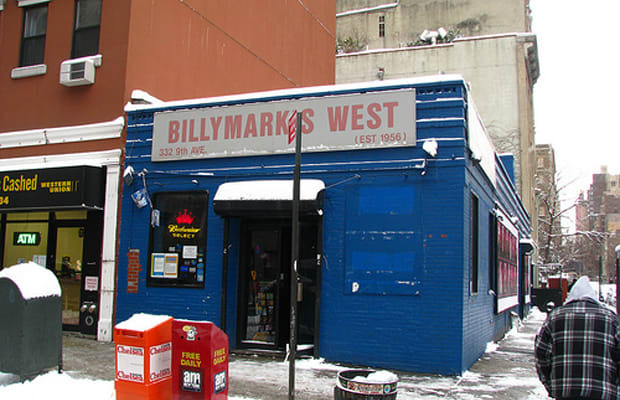 Billymark's West features on of NY's best: Billy Penza, the bartender you'll never see without his thick-framed glasses or striped short-sleeved button-ups the color of Easter. The bar features a jukebox that leans heavily on dance music and disco, seemingly at odds with the dingy interior and sometimes somber clientele. Penza is always charming though, ready to point out the platinum Blondie plaques on the wall (his brother, Mark, was a session drummer for Deborah Harry's outfit back in the day). A bright spot of realness in Chelsea.